For those of you who know me, (and maybe even those of you who don't), you most likely know that I love coffee. Sometimes I feel like I should replace my blood with the stuff. I think we'll have to wait until the 22nd Century for that. I drink anywhere between 1 to 3 cups a day, and a "cup" for me is usually around 12 ozs*. Obviously I'm going to want to have coffee when I camp and bike tour. Some people completely cop out and just make instant. Instant is not coffee. And preparing fresh, decent coffee on a bike tour is not that hard, as long as you have the proper tools. Over the last six years I've experimented with various different means of making coffee on the road. For all of these processes (except for the Moka Pot), you need some way of boiling water. Any way will do. I'll talk about camp stove setups in a different post. 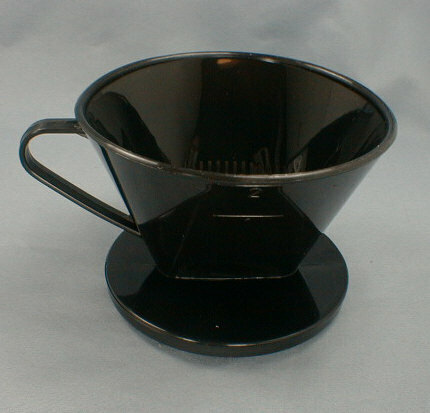 You'll also need a receptacle of some sort to brew the coffee and/or hold the finished coffee. My preferred receptacle as of now is a Kleen Kanteen Double Walled Insulated Mug. (I use the 16 oz size***.) I've used other mugs in the past and previously favored the "carabeaner clip" styled mugs you can find in some camping stores. But the insulated Kleen Kanteen holds in the heat. Right now I'm drinking from it and the coffee I made over three hours ago is still warm. This one's easy. Get one of those basic Melita cone filters (#2), put a filter in, put your ground coffee in the filter, and pour hot water over the grounds. (We'll define "hot water" as just below boiling, around 190-200 degrees F/90-95 degrees C.) Within a minute or two, delicious coffee! What I like about this system is the cone does not take up much space. If you get the style pictured, you can use a carabeaner clip to hold it to the outside of a pannier. And paper cone coffee filters are easy to find. You can buy a washable cloth filter as well, which is what I normally do. The big problem with a cloth filter is they don't dry fast, so you'll usually have to put a damp filter into a ziploc bag. If you don't take care of it, mold and fungus can grow. It was worrying about funky cloth filters that lead me to search for an alternative. Russ from the Path Less Pedaled turned me onto the coffee infuser method that utilizes the GSI Outdoors H2JO! filter. 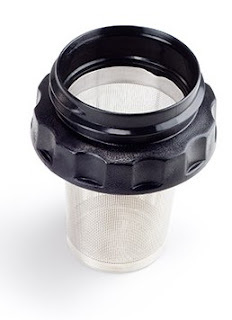 This filter is stainless steel mesh, so no funk or fungus! It's designed to screw into a wide-mouthed water bottle, of the plastic "Nalgene" style. They don't recommend using it with metal bottles, which Matt Picio speculates is due to how metal conducts heat. But my mug is insulated thankyouverymuch so no worries there. How does it work? Using the infuser method, ground coffee goes into the basket filter, while hot water goes directly in the mug. The filter screws to the lip of the bottle, and the lid of the bottle screws to the top of the lid. Theoretically everything should be water tight, but Russ warned me that there is slight leakage using the unrecommended Kleen Kanteen insluated. The bottle is turned upside down, then slightly shaken, and left for four minutes upside down. 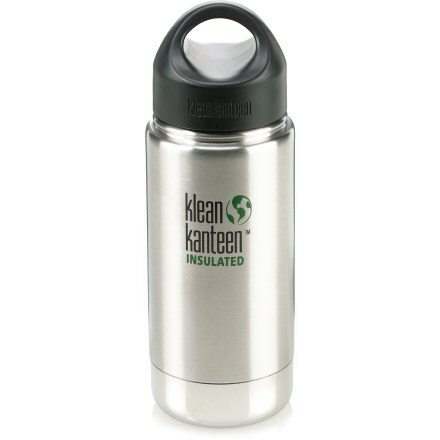 Since the Kleen Kanteen doesn't have a flat lid, I just sit it sideways. Then unscrew the filter, and voila! Coffee! The coffee is quite good and strong. It's pretty similar to French Pressed coffee in taste and texture; it has a certain slight graininess to it due to the immersion of grounds in water (just like a French Press!) Even though the coffee is ground at a coarse setting, you still get some dust. It doesn't take up much room, either. And you can use the H2JO! for loose tea as well. This will be what I use on tour. The only drawback I can see is to make it properly you have to fill up the mug completely with hot water, something you don't have to do for pour over methods. French Press is the "classic" immersion brewing method. Pour grounds in container, pour hot water over, then use the mesh plunger to extract coffee from grounds. You can get various different travel French Presses. The one I use is the GSI Outdoors plastic version (which I believe they don't make anymore.) Yeah, plastic can be considered blasphemy to a coffee snob, but it's light and doesn't break, which is a big deal bike touring. It makes fine coffee, but takes up too much space for my liking. (I guess I could string it to the outside of a bag or something.) So it sees limited use while camping. 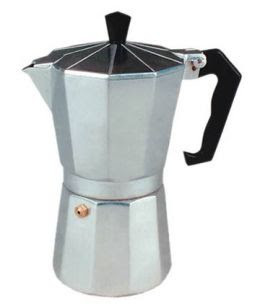 Moka Pot, aka "Stovetop Espresso Maker"
The Moka Pot is my preferred method for making coffee at home. It makes quite the strong brew, and can make even blah coffee tolerable. But most of the ones for home use are fairly large, though I know some peeps who tour with them. GSI Outdoors**** makes several models of "Backpacking" Moka Pots. I have an older 4 cup version that I picked up at a yard sale. The weight is reduced by taking away the top reservoir. And the U-shaped spigot is removable. Without a reservoir you need a mug to catch the coffee from the spigot. My Kleen Kanteen is too big so I use a small metal mug. So this means I carry around a mug that I use for nothing else but coffee brewing. So much for saving space. Since the mug sits atop the Moka Pot and the source of heat, it's too hot to drink out of, so you still need to transfer the coffee to something else. And it's still heavy and bulky after all the weight and space reducing techniques. So the backpacking Moka Pot only comes out on special occasions. Up until, ohhh...now, I was perfectly satisfied to grind my coffee beans at home or in the store and store the bag of grounds in a pannier. Easy. The problem with that method is ground coffee can get stale if you don't use it fast enough. But how can one grind coffee on the road? Earlier this year I decided to experiment with hand-crank style grinders. I needed a new one for the house anyway. The easiest one to find is the GSI Outdoors Javagrind, available at places like REI and even Fred Meyer. 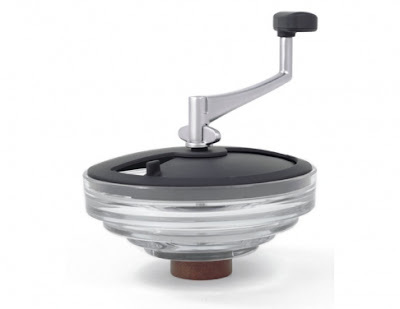 It's pretty easy to use, and can grind quite a bit of coffee. And it has a ceramic conical burr to grind the coffee, which leads to better tasting coffee than your standard metal blade electric grinder. But it's...big. And awkward. It's designed to fit inside another container (like a french press), so there's nothing to really hold on to. I got around this by sitting the grinder inside an old margarine tub. But its size was something I couldn't get past, not if I was going to take this touring. 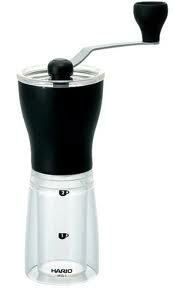 So another recommendation from Russ: The Hario Slim Mill coffee grinder. They are not that easy to find...yet. There are sources on the internets, of course, but since I live in Coffee City USA I managed to find a local source, Mr. Green Beans on N. Mississippi Ave. The design of the Hario Slim Mill allows for easy holding while grinding. And the lower chamber that collects the coffee is removable, so it will take up little space in my pannier. I can easily grind coffee directly into the infuser, no problem! The only issue with the Slim Mill is that it can't grind that much, but since I'll be the only coffee drinker on the road, it won't be a problem. The system I'll be using on the road (Hario Slim Mill and GSI Outdoors H2JO!) costs around $50. But if you pre-grind beans, a cone filter will only set you back $5-10. It doesn't take a lot of money to make decent coffee while touring, and isn't that hard to do. Now take that bottle of Nescafe out of your pannier and put it far back in the pantry where it belongs! ***Almost, but not quite, a half a litre. ****At this point, you might be thinking that this is somehow a paid advertisement for GSI Outdoors, huh? Well, they make a lot of good outdoorsy coffee brewing stuff. What can I say? Great info! Me and my wife were at Williams-Sonoma yesterday and I was checking out their ceramic version of the plastic cone coffee brewer you described. I was wondering how the coffee would compare to a French press. Maybe you've also already discussed this before (I apologize if I missed it), but what kind of kettle can you recommend for travel. I use two different presses when bike camping. The first, when I'm alone or when I won't have to share, is a travel press/mug. This one was a gift from a Bigbucks barrista, but they're probably available elsewhere. The mug is double-walled and keeps the coffee hot for a reasonable amount of time. It's also fairly small. Sometimes I carry a 4 cup plastic Bodum. This doesn't take up nearly as much space as you'd think. Once it's cleaned out, quite a bit can be stored inside it - ground coffee, utensils, a paperback, whatever. But if you're the only one drinking, it might be overkill. Of the solutions you've already discussed, I think the paper cone filters are best and I may try that this year. Cleaning a steel mesh screen on the road is a PITA and uses more water than I'd care to waste, especially if I had to filter it myself from a stream. The paper might be wasteful, but it's easy and quick. I guess if that sort of thing is a concern, you could keep them in a Ziploc until you come across one of those composting toilets that seem to be popping up at State parks these day. What are your bean preferences? Do you think you'll have to make exceptions on the road? Cone filter coffee (or if you want to use the new fancy term, "Pour Over") is pretty good tasting. I can't do the whole coffee snob thing and say exactly how it compares to French Press, but you can make it quite strong and it doesn't have the oily/gritty factor. Yep, again with GSI! This one is aluminum but they just started making a stainless steel. And will talk about it again soon! I've used the French Press travel mugs in the past. The one I used was the small Bodum clear plastic guy. I never warmed up to it because of its design--you are drinking out of the French Press, so I would get grinds in the coffee, and the coffee would taste progressively worse as the remaining grinds at the bottom would marinate in the coffee. I know there are newer, better systems. But all of the lids I've seen have some leakage due to design. I would rather have a spill-proof screw-top mug, so I can throw it in another bag and not worry about leakage. As for the H2JO! filter, it's not a thin mesh. I just tested it in the sink, and rinsing it for 2-4 seconds gets the remaining grounds out. I don't plan on doing wilderness camping on the trip, so I'm not too worried about having to clean the filter with filtered stream water. Yeah, part of the reason I prefer the cloth cone filter vs paper is the waste factor. As for coffee beans, I'm not the biggest snob in that factor. Truth be told, I buy most of my coffee from Trader Joes. (What, no Stumptown?) While on the road I'll just use whatever beans look best. Good info. I went birding for a week in North Dakota (a notorious wasteland for coffee, but excellent for grassland birds). We brought a themos and cone and had excellent results, and we could often bum hot water for free from gas stations, truck stops, etc. We did not grind on the road - for a week we were willing to endure this hardship. I can highly reccomend the Aeropress. Lightweight, easy to clean and super espresso flavour. Adam-I have heard good things about the Aeropress, and they are locally available. But I'd hesitate to take it touring. Despite its lightweightness, it still appears bulky. The H2JO! can screw into my Kleen Kanteen when not in use. And truth be told, right now I have TOO MANY different ways to make coffee at home, so I don't need another. Great post on coffee brewing methods. I am looking for a good infuser. I found some tea infusers that I am going to try out!